12″ x 16″ on Masonite dated ’50 Buyer pays for shipping. This is a wonderful opportunity to buy one or all four charming Mid-Century paintings by a beloved artist. 1899 Nahum Tschacbasov, the second oldest of nine children, is born in Baku, a town on the Caspian Sea, in Azerbaijan, Russia.1905 His father, Stephan, emigrates from Russia, settles in Chicago, and starts a printing business using a new family name, Licterman.1907 Tschacbasov, with his mother Sophie and brothers and sisters, joins his father in Chicago just as the financial crash causes the failure of his father’s business. Tschacbasov grows up in the Chicago slums.1913 He leaves school at the age of thirteen and takes a succession of jobs to help support the family. He attends night school for one year, studying electrical engineering.1918 He enlists in the Navy and serves as an electrician at Scapa Flow, off the northern coast of Scotland. The light of the North Sea impresses him greatly. “Nothing could compare with the Scapa Flow. My feeling for color in my work has drawn from this palette of the Northern Skies. The color in the North made me lose my deep feeling of depression.”1919-29 Returning to night school for three years, he earns a degree in business. Becoming an accountant and later an efficiency expert, he eventually forms his own successful business.He marries Esther Liss, who bears two children before the marriage ends in divorce.1929 Tschacbasov marries Esther Sorokin.During this time, he has a deepening interest in drawing and painting, which he has taken up in response to pressures of work and life. His first encounters with modern art are the works of Cezanne, Van Gogh, and Rouault.1931 Esther gives birth to his daughter Sondra, the subject of many of his paintings.1932-33 Tschacbasov moves for a short time to New York City in order to be in a modern art center and then to Paris, where he adopts the name Tschacbasov, an anagram of different family names. He studies with Leopold Gottlieb for eight months, then with Marcel Gromaire, who teaches him pictorial structure, and briefly with Fernand Leger.Working in his studio on the edge of Montmartre and later in the Hotel de Sante in Montparnasse, he produces a large body of work, retaining fifty paintings. After trips to North Africa, Spain, and the Balearic Islands, he travels often from Paris to New York City, where he spends six months painting a series of Depression-inspired pictures after finding that his American business has gone bankrupt in his absence.1934 In Paris, Galerie Zak exhibits landscapes from his trip to Majorca in the first one-man exhibition of Tschacbasov paintings; Salon de Tuileries also exhibits his work.His savings exhausted, he returns to New York via Tunisia in the midst of the Depression.1935 Living on Pineapple Street in Brooklyn Heights, Tschacbasov works on the WPA Federal Arts Project, Easel Division, where he meets other artists and becomes politically involved.His works are shown at Galerie Secession with those of Mark Rothko, Adolph Gottlieb, and other modernist and expressionist painters. Tschacbasov, Rothko, Gottlieb, Joseph Solman and others from Galerie Secession form a group called The Ten combining common aims of social consciousness with an expressionist and abstract style. Themes of social injustice are more dominant in Tschacbasov’s work than in that of others of The Ten, as he draws on his own childhood experiences of the harsh realities of immigrant life in industrial Chicago. 1936 In January, an exhibition of The Ten is held at Municipal Art Galleries in New York City, and later in the fall an exhibition, also of The Ten, is held at Galerie Bonaparte in Paris. Tschacbasov, now living at 9 Willow Street in Brooklyn, participates during February as a member of the National Executive Committee in the first meeting of the American Artists, Congress, an organization for the promotion of government subsidies for artists. 1936-43 He has five one-man exhibitions at ACA Gallery in New York City and participates in five group exhibitions. His paintings which focus on themes of social satire during this period include “Thanksgiving”, “Supreme Court”, and “Little Red Schoolhouse”. are Tschacbasov’s “Deportation”, “Clinic”, “Friday Night”, “Harbor Sunset”, and “The Matriarch”. 1936-37 Tschacbasov is appointed business manager of Art Front Magazine, a publication associated with the Artists’ Union and focusing on both aesthetic issues and economic reforms of benefit to artists. He withdraws from The Ten as a result of disagreements arising from his desire to promote the group on a platform of social criticism. 1937 Tschacbasov is now living at 1 West 21st Street in Manhattan. 1938-39 He moves to 31 East 21st Street. 1939 His circle of friends at this time include Philip Evergood, Milton Avery, Stuart Davis, David Burliuk, William Gropper, the Soyer brothers, Robert Gwathmey, Marsden Hartley, and Max Weber. Due to cut-backs in WPA funding, he teaches at his 38 West 22nd Street studio and at the American Artists’ School. On the faculty are David Burliuk and the Soyer brothers, as well as Elaine de Kooning and other artists with similar aesthetic and social points of view. Personal and artistic crises lead to his entering into Jungian psychoanalysis, which provides new impetus and direction to his painting. Under the influence of analysis, he starts to write portions of a surrealistic autobiography, The Moon is My Uncle. His paintings, “Refugees” and “Friday Night” are shown with works by Avery, Burliuk, and DeHirsh Margules in a group exhibition at Albright Art Gallery in Buffalo, New York. In September, the Berkshire Museum in Pittsfield, Massachusetts focuses on themes of social criticism in an exhibition entitled “The World Today”, curated by Elizabeth McCausland, which includes Tschacbasov’s, “Little Red School House”. friends and other artists, he builds a collection of color slides which serves as a foundation for the American Library Color Slide Company, an archives which continues to be of service in art history education. His painting, “Portrait of Sondra” is exhibited in the “Second Biennial Exhibition of Contemporary American Paintings” with works by the Soyer brothers, John Sloan, and others at the Virginia Museum of Fine Arts in Richmond. 1941 Tschacbasov exhibits at the Pennsylvania Academy of Fine Art in Philadelphia. 1942 Now living at 1 Christopher Street in New York City and painting in his studio at 30 East 14th Street, Tschacbasov participates in “Artists for Victory”, an exhibition of contemporary art at the Metropolitan Museum of Art, exhibiting his painting “Deportation”. 1943 Tschacbasov’s painting style changes from social criticism to themes that are personal and symbolic, leading to a break with the ACA Gallery. He spends part of the year living and working in Oklahoma City, where nature and the landscapes of Oklahoma serve as subjects for his painting. In the 54th Annual Exhibition of American Paintings and Sculpture held at the Art Institute of Chicago, his painting, “Deportation” is exhibited. He re-locates his studio and residence to the Chelsea Hotel, a West 23rd Street haven for artists, where he remains throughout the rest of his life. “strangeness of reality” is well received by the public and critics. 1944 Tschacbasov exhibits in the spring at the Cincinnati Museum in Ohio. His painting, “Garden of Eden”, is included in another exhibition at the Virginia Museum of Fine Arts in Richmond along with paintings by Joseph Stella, Max Weber, and the Soyer brothers. He is exhibited at the Corcoran Gallery in Washington, D.C. in the fall as well as at the Carnegie Institute in Pittsburgh, where his painting, “Lady with Mirror” is included. In December, the Metropolitan Museum of Art in New York City acquires his painting, “Deportation”. A one-man exhibition of his works is held at the Arts and Crafts Club in New Orleans. 1945-46 Children’s Holiday Circus of Modern Art, at Museum of Modern Art, December 4, 1945-January 6, 1946. 1944-48 Tschacbasov has four one-man exhibitions at Perls Gallery in New York City and participates in three group exhibitions. 1945 His painting, “The Admiral” is exhibited at the Art Institute of Chicago. Critic Harriet Loveman chooses his painting, “Sondra and the Solar System” for “The Critics’ Choice of Contemporary American Painting” exhibition held at the Cincinnati Art Museum. The Carnegie Institute in Pittsburgh, Pennsylvania exhibits his painting, “The Amber Necklace”. highlights of the year’s artistic events, notes Tschacbasov’s one-man exhibition at Perls Gallery, stating that “the fantastic fairy-tale world… kindred in conception to that of Marc Chagall, showed an obvious artistic superiority of the Russo-American over the Russo-French painter.” At this time, themes in his work include myth and archaic history. In January, he exhibits at Durand-Ruel Gallery in New York. Tschacbasov participates with painter Darrell Austin in February in a joint traveling exhibition organized by Perls Gallery and held at the Vigeveno Gallery in Los Angeles, the San Francisco Museum ‘ the William Rockhill Nelson Gallery in Kansas City, Missouri, and the Colorado Springs Fine Arts Center. Albright Art Gallery in Buffalo, New York exhibits his painting, “The Bride”. In the summer, Tschacbasov exhibits works at the University of Iowa in Iowa City and at the San Francisco Museum of Art. The Art Institute of Chicago exhibits his painting, “Twilight”. 1947 After producing two series of etchings in five intensive months and completing his long psychoanalysis, a new freedom emerges, culminating in his “signature style”. Tschacbasov wins the Pepsi-Cola Prize. His painting, “Rabbi in White” is shown in a group exhibition, “American Artists for Israel”, at the Jewish Museum. 1948 Tschacbasov begins a development of style which he terms abstract surrealism, a fusion of cubist forms with psychic imagery. Throughout the fifties he is to move toward greater abstraction of forms and linear structuring and organization of space. “The Patriarch” as one of the year’s best in “Prints of the Year”, in Art News Annual. In the Spring, he exhibits at the National Academy of Design in New York City, and his painting, “Substance and Sustenance” is shown at the Virginia Museum of Fine Arts in Richmond. In the summer, he exhibits at the Toledo Museum of Art in Ohio and acquires a house and studio in Woodstock, New York, where he establishes the Tschacbasov School of Fine Arts, all of which he maintains until 1956. 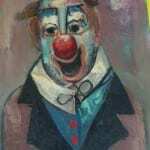 1949 The Whitney Museum of American Art in New York City acquires “The Clown” and “The Matriarch”. Tschacbasov exhibits at the University of Illinois in Urbana. 1950 A one-man exhibition of Tschacbasov work is held at the John Heller Gallery in New York City, and another exhibition is held at the University of Illinois in Urbana. 1951 John Heller Gallery in New York City has another one-man exhibition of his work. 1953 Again, the John Heller Gallery in New York City has a one-man exhibition of his work. 1955 A one-man exhibition of 25 paintings of Tschacbasov plus his etchings and ceramics is held at the Jewish Museum in New York City, and the University of Illinois in Urbana has another exhibition of his work. 1957 Tschacbasov works are exhibited again at the University of Illinois in Urbana. 1950’s – While Tschacbasov continues his involvement with painting and etching, he also works in 1970’s ceramics. He teaches in this medium for several years at the Chelsea Hotel. 1950’s – Exhibitions of his paintings and etchings are held at colleges and universities throughout 1980’s the United States, including the University of Maine at Orono, the University of Georgia, the University of Texas, Willimantic State College in Connecticut, and Lycoming College in Pennsylvania. 1961 Esther, his second wife, dies. 1966 Tschacbasov marries Irene Zevon on August 31. 1970 He acquires a beach house in Amagansett, Long Island and subsequently purchases a second, larger house in which he maintains a studio in East Hampton. 1974 A one-man exhibition of Tschacbasov works is held at Pace University in New York City. 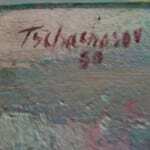 1976 Tschacbasov participates in a group show at Guild Hall Museum in East Hampton, New York. 1980 Guild Hall Museum invites him to participate in another group show in East Hampton. compilation of surrealist poems, drawings, and etchings of Tschacbasov with an introduction by Anna Balakian. Expressionist Vision, A Central Theme in New York in the 1940’s”, at Hillwood Art Gallery in C.W. Post Center at Long Island University. Paintings exhibited are “Landscape and Trees”, “Flower Port”, “The Four Muses”, and “The Matriarch”. 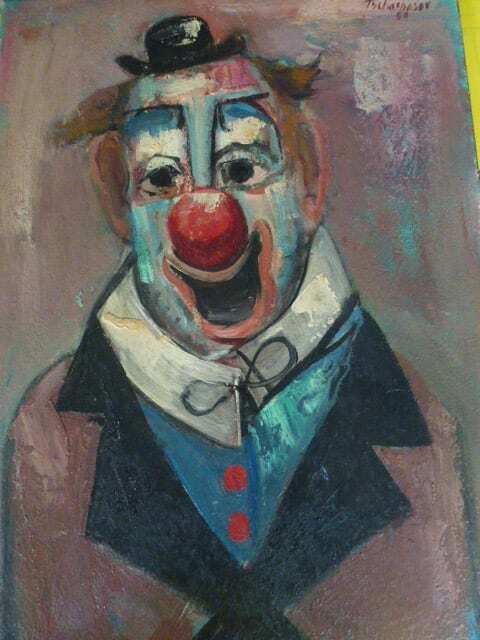 Other artists exhibited include Max Weber, Marsden Hartley, Abraham Rattner, David BurliUk, and Jack Levine. 1984 Tschacbasov dies on February 18 in New York City.